Hello everyone: Well, time sure flyes when you are having so much fun!! We at THE FLOWER CHALLENGE are Celebrationg our 1st. Birthday, WOO HOO!!. We can't believe one year ago this fabulous challenge blog started with just a thought, an idea, a wish made by my dear friend and team leader Aileen Ryan from Colour and Sparkle who gathered all of my amazing teammates and me to join her in this adventure. I must confess I was a bit intimidated maybe? by all of these incredible card makers from around the world, but all of them made me feel so welcomed and comfortable to be a part of this team that I happily accepted and for that, I'm incredibly grateful. This challenge is going to be a big celebration, not only because we have the amazingly talented Therese Calvrid, from Lost in Paper as our Guest Designer, but because we also have 2 fabulous former The Flower Challenge Design Team members, Karren Johnson, Lisa Tilson and last but definitely not least, we also have a new Guest Designer EunJi Jung with us to help CELEBRATION!!!!! And that's not all, my friends, we also have some fantastic prices for you, our loyal followers, from some of the best companies out there who so generously offered to contribute some fabulous stuff for you to win. 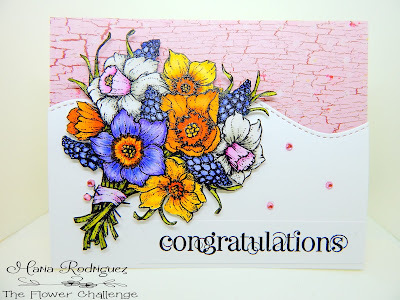 We are so grateful to all of you for helping us along the way by sharing your beautiful creations with us every month, you have made our gallery look amazing and my teammates and I have had lots of fun admiring your cards so, be sure to hop over THE FLOWER CHALLENGE blog to get all the details about this Anniversary Post, to check out my teammates amazing creations and to upload your cards to the gallery. Please be sure to READ OUR RULES, they are a bit different just for this challenge. This is the card I made to celebrate our 1st. Anniversary, I hope it inspires you to get crafty and join my teammates and I in the gallery. 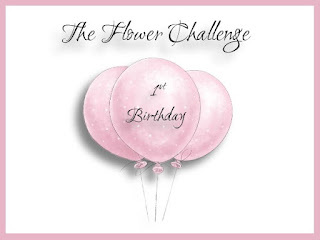 And this is THE FLOWER CHALLENGE banner, please be sure you add it to your post when you upload your card to our gallery. The beautiful image I used for my card is from Power Poppy, who is one of our fabulous sponsors. I asked Marcella Hawley to help us celebrate and she happily accepted and offered a $30.00 gift card. This set is called Daffodils, which are some of my most favorite flowers. After a looooong Winter up here in Crown Point, IN. one of the first signs that Spring is coming are my Daffodils bravely peeking out of the cold soil after their Winter slumber, their pretty, bright flowers give me so much joy. I stamped this bouquet onto a panel of water color paper and then I colored it with water colors and my Prismacolor pencils for detail and shading. Then I fussy cut it to prop it on my card front, it was a bit hard but I have a great pair of small scissors and I also put a couple of pieces of Scotch tape behind the smaller parts like the leaves and the pins, that way the paper holds on better and the image is intact. I added a couple of Rhine Stones to the pin heads and a few scattered around. The pattern paper is from Lili of the Valley. The sentiment and party horn are from a Power Poppy set called "Marcella's Mixed Tape 2"
For more inspiration, hop over to THE FLOWER CHALLENGE blog to see my teammates gorgeous creations and also, to READ THE RULES for this challenge, then join us in the gallery. Thank you to our sponsors for their generous contributions for our celebration, you made this challenge even more fun. I want to thank all of my teammates and especially Vivien Hodge, for being our most awesome boss, LOL!! she kept this blog running smoothly, nudging us once in a while to upload our cards, creating the gorgeous water marks and banners and fixing links and stuff like that for us. 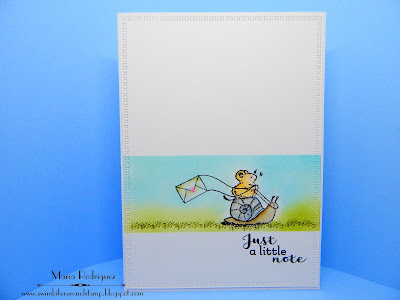 Hello everyone: Like the title says, "Snail Mail is Happy Mail", there is nothing sweeter than opening your mailbox and finding a handmade card from your friends and family, among the dreaded bills and junk mail. So here is a card I created celebrating our beloved "Snail Mail" and I will link it to a few challenges at the end of this post. A Inky Mess Challenge #14 "Anything Goes" Just for fun. 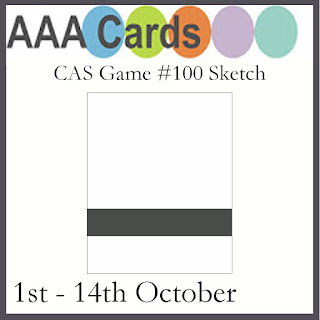 Aurora Wings Challenge #58 "Clean and Simple"
Penny Black and More October Challenge "Close to Nature"
AAA Cards Game #100 "Sketch"
Hello everyone: There is a new challenge over at SHOPPING OUR STASH, this time we want you to create Thanksgiving or Thank You cards, with the start of the Holiday season just around the corner, this is your chance to add to your Thanksgiving card stash. Here is the card I made that I hope will inspire you to join my teammates and me in the gallery. 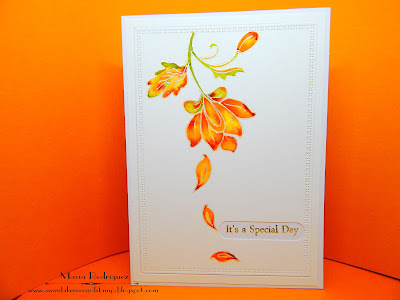 This image is from my stash of Flourishes stamp sets, this one is called "A Season of Thanks", which came out back in 2011. All the images are so beautiful and perfect for the Season. The little sentiment is from my little box of sentiments that I save when I change my mind, it came out handy for this card. The sentiment is from another Flourishes set called "Lots of Thoughts", I stamped it onto die cut panel of cream cardstock with SU Old Olive and More Mustard markers using my Postage Stamp die set, I sponged a bit of Baked Brown Sugar on the edges for some dimension. So there you have it, hope you stop by the SHOPPING OUR STASH blog to get more inspiration from my teammate's creations and then come and play along. Always Fun Challenges Challenge #26 "Dies or Punches"
Fairy Tale Challenge Challenge #177 "Decorations inside and out"
Dare 2B Artzy October Challenge "Fall Colors"
Hello everyone: Up here in the Midwest, Autumn is starting to show it's lovely colors all around my neighborhood, the leaves on the tree tops have those lovely shades of orange and yellow with still a hint of green and some of them have started to fall, so pretty soon, it's going to be racking time, but for now, the show has begun and we are loving it. I made this Autumn card that I will link to a few challenges at the end of this post. 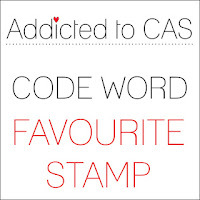 One of the challenges I'm participating in is Addicted to CAS and the CODE WORD is FAVORITE STAMP. Well, I must confess that I love all of my stamp sets so picking a favorite is hard so, I picked this one from Altenew called Persian Motifs just because it popped into my mind as soon as I read the Code Word, perhaps it's because the other day I was watching THIS VIDEO by Jennifer McGuire and it reminded me how much fun is to color (or attempt to color) this images more or less like she did. 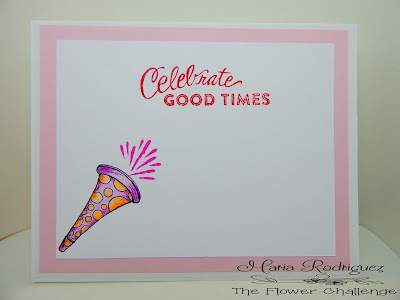 I stamped the image with Versamark ink and heat embossed it with the WOW Silver Pearl embossing powder then colored it with Sakura Koi water colors and a bit of Stampin' Up! Cherry Cobbler re inker. Now the sentiment was NOT supposed to be done like this but I made a BIG mess lining it up, it was so darn crooked I almost tossed this panel in the trash but, I collected myself and thought of a way to maybe fix it?? So I grabbed the SU Word Window Punch (retired😞) and carefully punched out the crooked sentiment and, after adhering the panel to my card base, I put it on the MISTI and super carefully stamped it again, using the SU markers in Old Olive and More Mustard. Phew!! it worked fine, I think. I tried hard to keep this card as CAS as possible, hope my "fixing" didn't mess it up! The sentiment is from another Altenew set called Beautiful Day, the leaves from Persian Motifs. 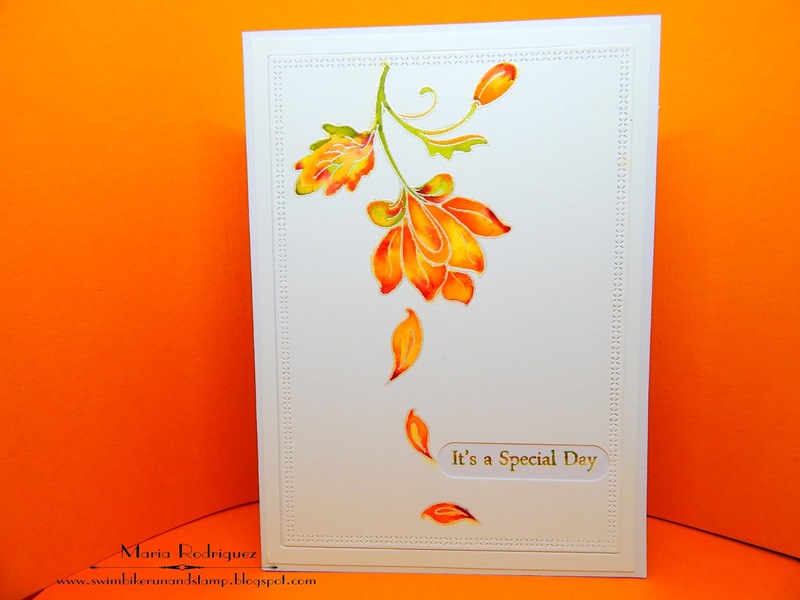 A Gem of a Challenge #204 "Birthday Card"
That's Crafty Challenges "Forever Autumn"